Filling Pieces founder Guillaume Philibert studied architectural design before starting a career designing shoes. Which may go some way to explaining how the brand’s sharp, architectural kicks set it strides ahead in the sneaker world. As the name suggests, the Dutch firm aims to bridge the gap between streetwear and high-end footwear. And it succeeds. By turning out contemporary, sportswear-influenced shapes – each handmade in Portugal using premium Italian leather and suede – Filling Pieces has laid the solid foundations for a cult sneaker brand unlike anything in the market. It’s fitting, then, that to build on its success for SS17, Filling Pieces looked to Madagascar for inspiration, where 90 per cent of the wildlife found exists nowhere else on earth. The latest Filling Pieces collection comprises 600 styles across 14 fresh silhouettes. And for the first time in its history, the brand has manufactured its own sole units, resulting in five custom sole innovations. A large number of new styles and silhouettes dropping throughout SS17 are a direct result of the creations of the FP soles by the design team; including the Steel Runner, which in addition to a perforated suede upper, features a unique tread inspired by the denticles on a shark’s skin. Staying true to its roots, Filling Pieces has continued to make use of unique design details throughout the collection. Alongside denim as a contemporary alternative to leather or suede, distinct lacing systems provide an eye-catching point of difference. Cementing its dedication to innovation, SS17 also sees the launch of the very first knitted Filling Pieces sneakers. The two debut styles are each crafted using different stitching techniques to reinforce specific areas following the natural movement of the foot. The Runner Sac and Roots Runner are made from a single knitted upper with details such as a padded heel and leather reinforced back, designed to replicate the shape of the foot for a perfect fit and natural sock-like feeling. Despite picking up on the popular trend for knitted sneakers, the models explore new ground by using antibacterial Lycra (traditionally found in high-performance sportswear) for added stretch and a longer lasting box-fresh smell. One of two all-new knitted styles debuted for SS17, the Roots Runner Knits is constructed using a black upper and contrasting white ripple-effect cupsole. Adding to the urban refinement of the model, the lifestyle runner swaps out visible branding for a sleek leather heel panel and pull tab. Bringing some streetwear appeal to the white sneaker trend, the Low Top Ghost is crafted in premium nubuck leather with a supple matte finish. The elongated tongue, padded collar and flat lace-up fastening all contribute to giving the shoe a unique shape that sets it apart from all the other white kicks currently on the market. The Roots Runner Roman sneaker takes its name from the subtle embossed details on the brand new sole unit. As well as continuing the tree-theme, the moss colourway of the premium suede body taps this year’s biggest colour trend. 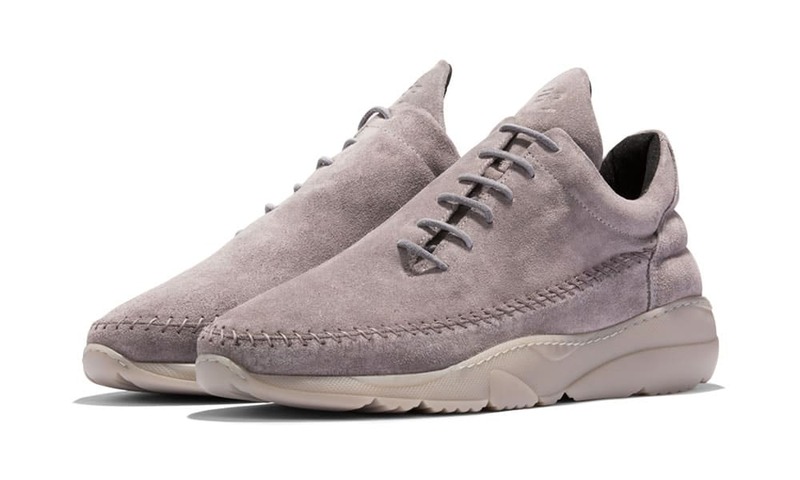 Typifying Filing Pieces’ approach of fusing authentic craftsmanship with contemporary design, the Low Top Thick Ripple is set on a rugged outsole that provides the perfect foundation for its luxe upper, which is rendered in premium suede for ultimate comfort. Showcasing the brand’s knack for precise hand-craftsmanship, the Apache Runner Low is detailed with decorative stitching through the midsole and off-centre laces for a directional slant on the traditional running silhouette. Shop the full spring/summer 2017 footwear collection now online at fillingpieces.com.